A sea of eager, young faces gathered in a large conference ballroom on the final day of the sixth annual HBCU Innovation Summit. The highly anticipated career fair was about to start. Students dressed in their best professional attire would have a few hours to meet top tech recruiters and hoped to make a strong enough impression to secure a summer internship or full-time job offer. Polite Stewart Jr. can be spotted among these bright, hopeful faces. Stewart is confident and poised with a quiet but strong presence. He is returning to the summit as a mentor this year. Stewart is the type of candidate that recruiters dream about. He’s a prodigy and rising star in the computer science field. Stewart holds two bachelor’s degrees from Southern University, one in physics that he earned at 18 years old and another in mechanical engineering that he earned a few years later. Stewart now works as a software developer at IBM Watson Health in Cambridge, Massachusetts. “This is one of the most fulfilling experiences because I can give back to the students. What I learned at this summit helped me excel in my job interviews and secure my current job. Students need access to the right mentors who will prepare them for rigorous interviews,” Stewart said. UNCF concluded its annual HBCU Innovation Summit in Silicon Valley on Sunday. 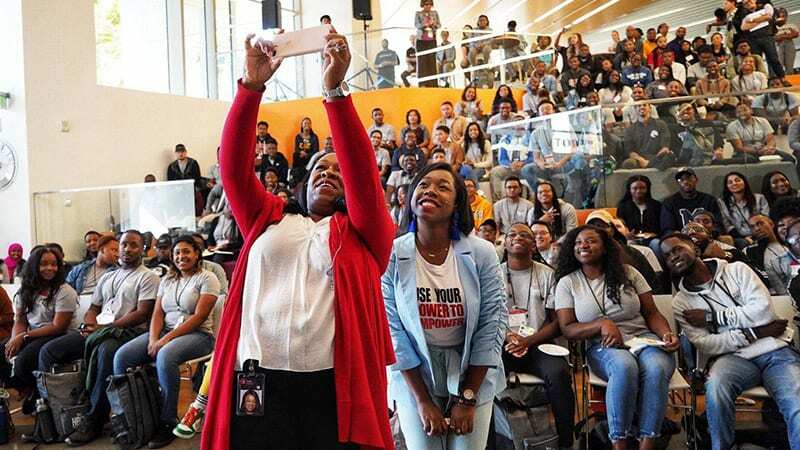 Participants included HBCU students, faculty, school leadership and members of the Silicon Valley tech community. African American men and women continue to be underrepresented in tech. There are also unique challenges women have faced when entering the tech workforce. Chad Womack, UNCF senior director of STEM Initiatives, participated in President Barack Obama’s Tech Inclusion Summit Initiative in 2012 and proposed that the White House support an HBCU-led effort to connect the community directly to Silicon Valley stakeholders. UNCF led the effort to build stronger and deeper relationships between the HBCU community and Silicon Valley. Six years later, the summit serves as a viable solution to industry challenges, including diversity, inclusion and equity. One hundred and fifty fellows were selected to represent the best and the brightest among HBCU computer science talent. Fellows were primarily undergraduate juniors and seniors majoring in computer science and computer engineering with an average GPA of 3.56. Plus, a number of the fellows were high school valedictorians, award-winning students and individuals who overcame extreme obstacles to rise to the top of their academic programs. School leaders also played a role in the event. Twenty faculty members and leaders were invited to join the summit in Silicon Valley. HBCU computer science and engineering faculty and leadership shared best practices in computer science pedagogy. They also discussed how HBCUs can pivot to support innovation, commercialization and startup/tech entrepreneurship on their respective campuses. For four days, the HBCU Innovation Summit featured tech tours, workshops, a career fair, interviews and computer science faculty workshops. Fellows began the summit with tours of 14 Silicon Valley and Bay Area tech companies. These companies included Pure Storage, Visa, Google, NetApp, Electronic Arts Inc., StubHub, eBay, Pixar, Twitter, Salesforce, Symantec Corp., Walmart Labs and Adobe Inc. The summit also included panels, a career fair, interviews, presentations and a keynote speech. Vince Lopez, engineering manager at Workday and HBCU advocate, conducted interviews with fellows at the career fair. “It’s amazing to see increased engagement across the HBCU and tech industry landscape. We’ve identified some amazing, talented students that could work anywhere they wanted in Silicon Valley,” he said. The HBCU Innovation Summit is critical now more than ever. HBCUs continue to be extraordinarily relevant for the social and economic success of black America. Lu Duong, director of STEM and tech initiatives at UNCF, could be found engaging with students and beaming with pride throughout the summit. The impact of the program is evident: One-third of 2015 and 2016 fellows interned or worked full time at leading technology companies. Chinagorom “China” Louis, fellow and sophomore at Prairie View A&M, plans to encourage her classmates to apply to the program next year.